We provide our guests with a private, relaxing and traditional Northern Ontario Cottage experience with a significant amount of amenities. Sunny Point is the premium pet friendly cottage resort in Northern Ontario. 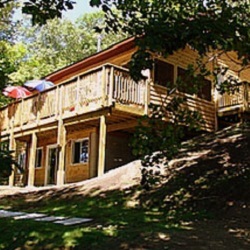 Pet Friendly Cottage Resort 20km South of Parry Sound, Ontario and 2 hours North of Toronto, Canada. Sunny Point Resort has 10 waterfront 3 and 4 bedroom cottages all pet friendly with private drives and docks, an All-Suite Inn with 7 Suites – Junior, 1 and 2 Bedrooms all with full kitchens and the Grand Muskokan 5 or 7 bedroom Executive rental. Private setting with all units lakefront on Otter Lake, (among the cleanest lakes in Ontario).